As a primary school teacher, I knew that there was something missing from my teaching. I felt that I was not accessing every student and I could see that some students were having difficulties that affected everything that they were doing. 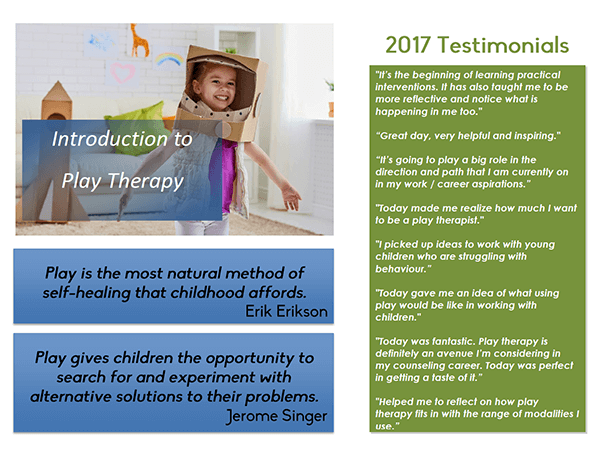 As I researched how I could become a better teacher, I came across play therapy, and the Play Therapy International/Play Therapy Australasia course. I would recommend that EVERY teacher be trained in therapeutic play skills, as it is so powerful. The hands on certificate course was fabulous, and I now feel equipped knowledgably to adequately deal with what may happen in the classroom, and in the future, the play therapy room. A child cannot learn if there are other issues blocking this learning – the skills learnt in the course are invaluable in providing strategies to assist across so many areas. Coming from Counseling background, I was looking for an organization that has high standards of professionalism and ethics in their training and practice. PTI and PTUK has made my career development decision to become a Registered Play Therapist successful one. I am honored to be a member with them. Also, sharing my dream with people who have the same passion and becoming family with them for 15 days is an outstanding experience on its own. I would travel the 22 hours to Australia again for my diploma. The course has enabled me to get a much better understanding of therapeutic play and how it could really help children who are in pain. It’s simply POWERFUL. On top of that, I feel myself growing as an individual as the experience of going through the course has enabled me to relook into my own childhood and life. Things start to make better sense and I feel more connected with myself and loved ones around. The training, being part theory and part experiential, gave a good overview of the tenets of play therapy. The opportunity to participate in the activities not only developed an understanding of the process and how play therapy works but also allowed us to address personal matters. The Course Director was approachable, very knowledgeable and built our confidence as she taught us to 'trust the process'. I think the best thing for me was the energy of the group and the support it provided. Also, the Course Director was an excellent teacher, she was knowledgeable and paced the course really well. The practical and hands-on experiential nature of the course was fantastic. Being able to connect the theory to the practical immediately was really helpful. I will be pursuing the Diploma next year. I really enjoyed discovering the world of play therapy and the experiential way we learnt to implement the toolkit. I also found the neuroscience section interesting and very relevant to my work with children now. The course was very experiential, which I loved. I enjoyed the music, movement and sandtray days especially. Experiencing therapeutic play myself I could really understand how it works. I felt very supported by the Course Director and the group of really great like-minded people. I feel PTI is a great organization to become a member of.